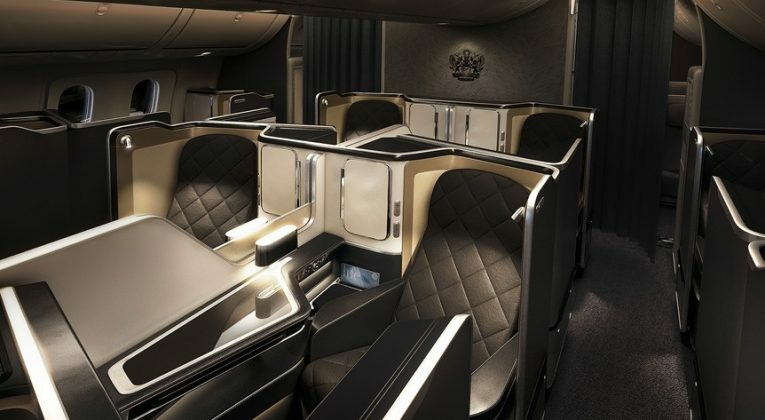 If you are looking for a cheap First Class flight to the US, now may be a good time to bag yourself a great fare. 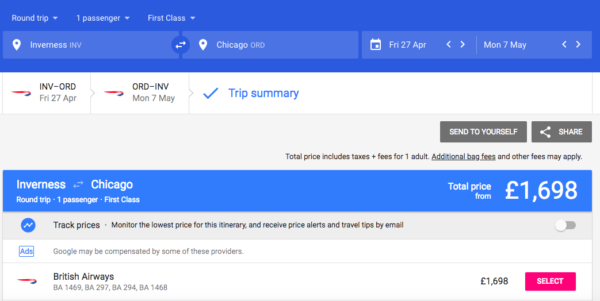 BA First flights from Inverness to Chicago are currently selling for £1,582 return when booked via online travel agencies (OTAs). There seems to be some good fares from the UK at the moment. Inverness may be a bit out of the way for those of us down in England but nothing too unmanageable in terms of positioning – certainly no worse than most ex-EU positioning games. I’d use Google flights to find availability and check OTA pricing on Skyscanner, Kayak and Momondo. This should be the usual price ! And I may say that Inverness is a very fine place to visit as well, either on the way there or on the way back. In fact the many more rural parts of Scotland are so fine. You can hire a boat and go along the canal – the only negative is the shortage of attractions along the way. Always very interesting to hear about First Class. Much cheaper than a stamp these days. Thanks Hamed! – I know Scotland up to about Oban pretty well, but really do need to get further North next time! 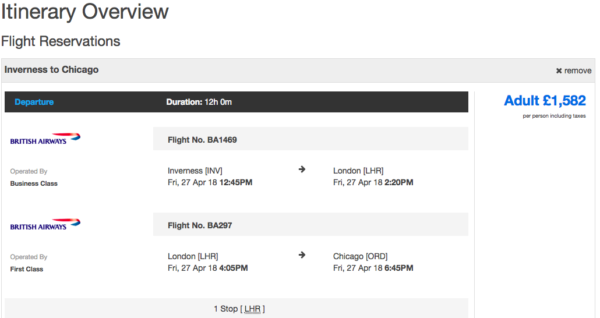 Does anyone have any experience of taking back to back flights in and out of Inverness? Is it easy to disembark, go landside and go back through security in time to get the same plane back to London?